I can’t take the credit on this idea, it was all Craig. He always adds bacon for a pizza topping and he loves thin crust pizzas. 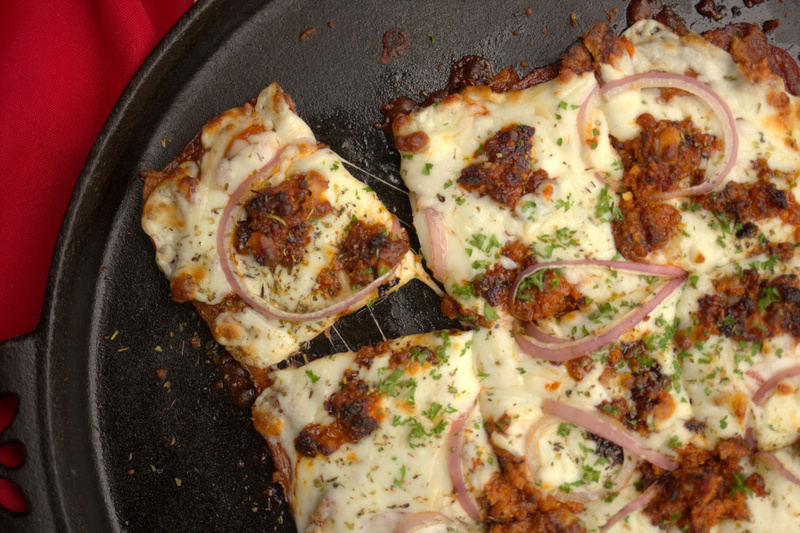 So one day he said… “I think a bacon crust would be amazing for a pizza!” I loved the idea because most “keto” pizza crusts have nuts or nut flours such as almond flour and I find that causes many of my clients to stall. 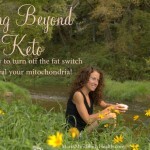 Learn all my tips and tricks in my new class: Going Beyond Keto. So we did it. And you know what… it was awesome! 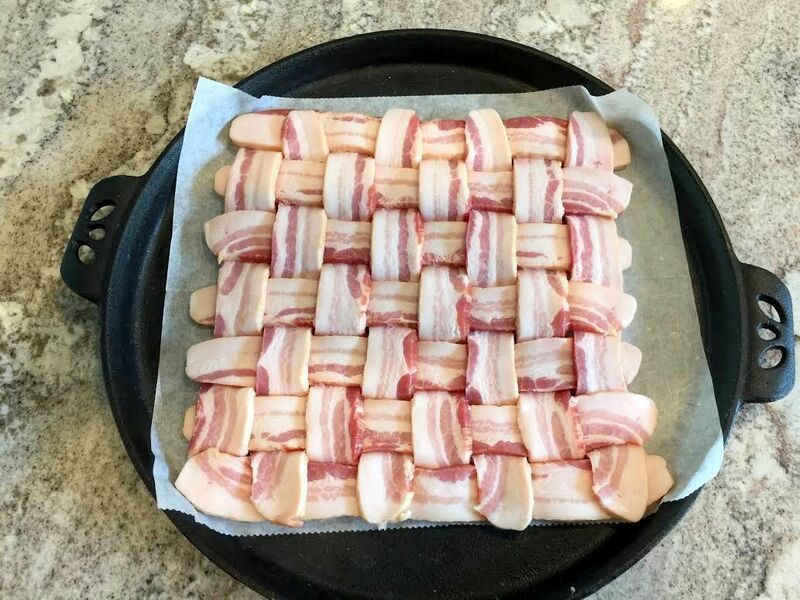 Craig is a very patient artist and weaved the bacon together (see photo). Start your path to healthy healing today! A year from now you will thank yourself! Hoe Lee Maird! That is awesome! 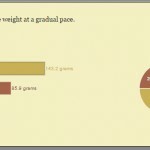 Are the macros per slice or per the whole pie? This is fantastic! I bet you could make a really good breakfast pizza too. Ooooh! You guys always have good ideas. OMG!! I can’t wait to try this!! Oh my, what a wonderful idea! Thank you Craig and Maria! I love that you have the percentages of the fat, protein and carbs for the recipe. Okay, thanks for your reply. However, I thought you had stopped using the Trader Joe brand because it contains soy lecithin. As does this one. What do you think? God bless Craig! 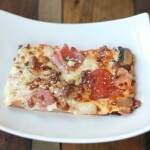 As a pizza lover frustrated because I can’t have a pizza crust these days, I can’t wait to try this recipe. Just bought the bacon and have the rest of the ingredients, so tomorrow will be pizza day at last! Thanks! Oh, yum! I’m making this tomorrow for sure! Just a thought, when I fry bacon in a pan I get a lot of bacon grease (to use for other keto items, of course) should I pour off the grease from this before I put on the toppings? Maria I’m overjoyed to see you have monthly memberships where questions can be asked. On payday, 15th, I will be signing up. I have a problem no doctor can solve. I had my gallbladder out 2 years ago in Feb and after packed on the weight–60 lbs eating keto! I was sent to several specialists and no one could help. 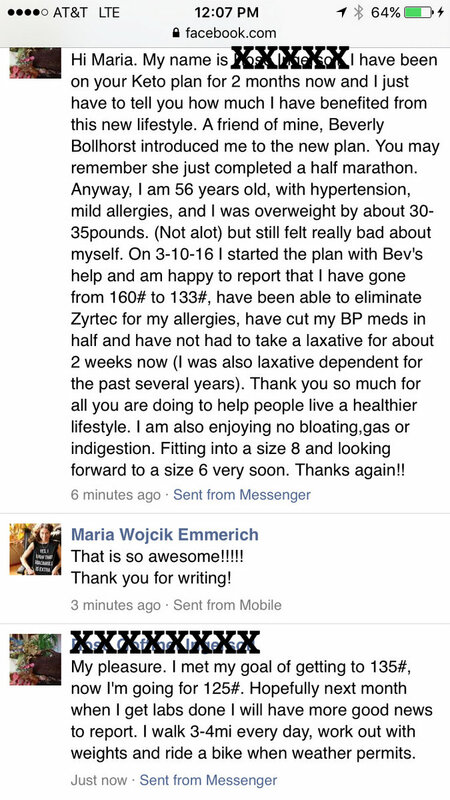 I started taking digestive enzymes and always took probiotics. I did HCG and managed to take off 40 but once I quit doing it (3 rounds last year uggh) the weight came back. And I eat barely anything. If this weight gain doesn’t stop I don’t know what I’m going to do. I’m looking forward to your insight! O common !!! who needs crust if you can have this !!! You guys outdid yourselves with this one !!! I’m actually wondering why you even need toppings. The bacon looks good all by itself! Just kidding. Gonna try this soon. Sooo good!! Thank you Craig and Maria for Another awesome recipe! I tried making bacon in the oven once and it caused a concerning amount of smoke. any tips to reduce that? It was delicious. Would cooking it on parchment paper help in any way with all that grease? Also, since mine made so much grease and I had it on a shallow, cast-iron pizza pan, I removed mine after 25minutes even though not all of the bacon wasn’t crispy. I figured it was ok to eat at that heatpoint and time frame. Maria, would turkey bacon be an ok option? Our family doesn’t eat pork anymore. For those of you wondering about what to cook on I use this rack when I cook individual slices of bacon on occasion it will stick but i can usually get it to pop off in one piece. if you turn the bacon midway tho it usually doesnt stick. Think how good this would also be with a white sauce and maybe bbq chicken and red onions! 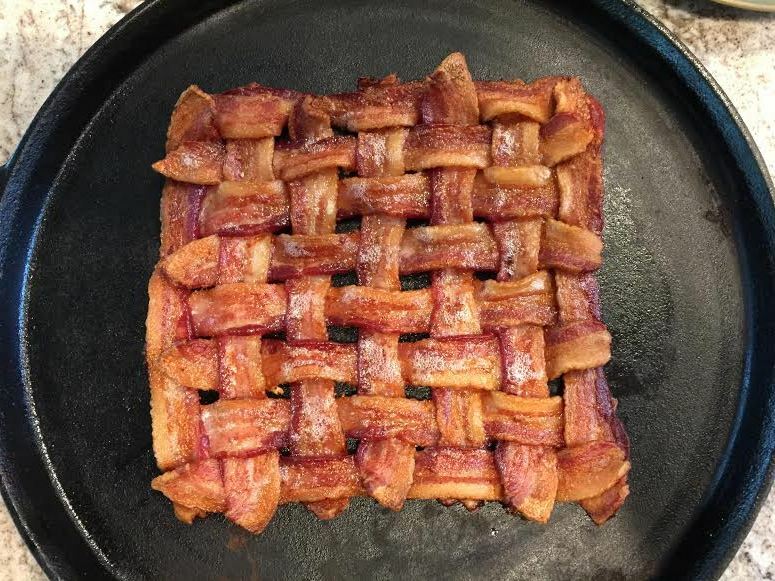 Stellar idea, that bacon crust! What kind of meat mixture did you top this with? It looks delicious! Red onions and parsley?